Cabin, 3 Bedrooms, 2 Baths, (Sleeps 6-8), No WI FI. Secluded Cabin in the forest on a dirt road with decking to the dock on the Chattahoochee River. Unplug and enjoy nature, NO WIFI. Not recommended for children under 8. Small pets with approval only, by owner. ACCESS THE RIVER AT YOUR OWN RISKS. Great for canoe or gentle kayaking. 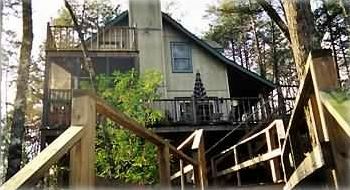 Come enjoy a cabin on the Chattahoochee River, deep in the forest. Fishing off the dock or tubing and rafting to the bridge about half mile down; or further river excursions-check with Outfitters in Helen, Georgia about seven miles away. Enjoy the amenities of a small 'Alpine' mountain town, shopping, restaurants, bars. OR go hiking, mountain biking, and whitewater rafting in the North Georgia and North Carolina Mountains. Appalachian Trail starts close by and sections easily accessed. Great Mountain Bike trails close by. Olympic whitewater rafting about two to three hours away. Nantahala, Franklin, and Highlands close for a day trip. Private Hot tub, satellite TV, gas grill, rocking chairs on the front porch, and fully furnished home for your relaxation if not in the mood for travel and activities. Sit in the swing by the river and observe the wildlife, and listen to the quiet of the forest and the flow of the Chattachoochee. I am a native Georgian, growing up on a farm close to the Athens, Ga area. After working in downtown Atlanta 20 years, I fell in love with the North Georgia Mountains and transitioned to this area by purchasing this lovely river house rental. Totally away from it all and a place to unwind from the busy city areas. A place to check out the most beautiful places Georgia has to offer, hiking, cycling, and canoeing. It is definitely for the person who likes the outside and who likes to enjoy nature. It is one of the few properties that is a rental on the River. Accessing the river is difficult unless you have property or use a company, I have found out, by living here. Peaceful, getaway: NOT LIKE STAYING IN HELEN in a small motel or larger hotel. Floating in your spot on the Chattahoochee, not following the bunch of tubers , bumper to bumper , in Helen. The house is on the Chattahoochee River, and accessing the river was a main reason I purchased this house. I spent a long July 4th tubing on the river , passing this house along the way and realized this is what I wanted for myself and as a rental for others to enjoy. Each full bathroom is separate from bedrooms, one upstairs and one downstairs. Access to Chattahoochee River, tubes available for use if skilled. Your liability. Rental for canoe services are in Helen. Take out is about 1 mile at hwy 255 bridge. Central Heating and Air. *Additional air conditioner (window) units in 2 bedrooms upstairs. bath towels and pool towels for hot tub. sofa, love seat, large dualie chair, and recliner; satellite tv, vhs, dvd; wood- burning fire place. coffee, tea, creamer, sugar. Brita filter for well water. ask owner about river tubes and life jackets-- you can bring you own as well! Bring your kayaks, canoes and river tubes-- Chattahoochee River at this house!! Cabin is private property on the river. 255 bridge is the closest pick-up location, about 1 hour by tube. Helen,a German style town, is the main draw to this area. For summer, tubing in the Chattahoochee River is the ultimate, cheap cool activity. As fall rolls around, it is Octoberfest, from late September until first of November. There are numerous German restaurants and bars and the Festhall with nightly activities at that time. For outside enthusiasts there is the Appalachian Trail and other hikes , mountain biking trails at Unicoi, and the 6Gap Century the last Sunday in September, starting in Dahlonega; another delightful mountain town to visit as well. The fall also bring the leaf peepers who enjoy the many rural roads to see the colorful season change. Of course the area is a big draw for Motorcycle riders for the thrill of curves and downhill. Winter sometimes brings snow, which is a lovely way to experience the mountains as well.